There is hardly any doubt about handbags being the most popular fashion accessory in the whole world. Handbags are literally considered to be a fashion statement nowadays. It is extremely popular in western countries. It is known to be the place where women hardly step out without a handbag. From fashion shows to parties, these fashion handbag complements the dress that they are wear. A woman may be wearing a stunning, gorgeous dress. But if the handbag that she is carrying is not fashionable or does not suit the dress she is wearing. Then the entire look may be ruined. This is the primary reason why handbags are given so much importance by women. In short fashion handbag is here to stay and will continue to set new trends in fashion in the future as well. As for women, a fashion handbag is a part of their attire. So they take a lot of care while selecting their handbags as they want to show that they have a unique & sensible sense of fashion. For them carrying a handbag that will complement & enhance the dress they are wearing will definitely get them noticed. Of course, handbags still are used by women to carry stuff that they require like their wallet, make up items, their id’s, mobile phones etc. But the space in a handbag is not the only criteria that they look for while selecting a handbag. Fashion handbags are come in different sizes, shapes and are made of different materials. Previously, handbags used to be simple, but nowadays more complicated designs are available. 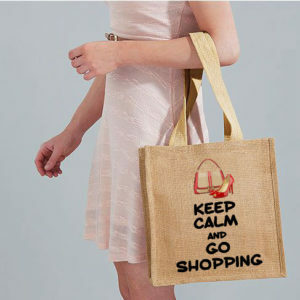 As for materials, with all the environmental awareness spreading around the world- environmental shopping bags made from reusable bag material like jute, cotton, canvas, juco, etc are gaining rapid popularity among the ladies. Customized fashion handbags made from these fabrics have also come in vogue these days. Taking advantage of this relatively new fashion trend, Sara International– a jute bag company, is manufacturing, supplying & exporting bags all over the world.